All of our steel necklaces are of the highest quality and mostly made of 316L surgical steel. Look through our selection and if you need some help contact us at the number above. 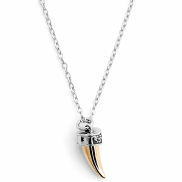 At Trendhim we do not sell real gold necklaces, instead we provide them with a great choice of gold coloured stainless steel ones. True gold is a very soft material, so a necklace made of gold is not as strong as steel and is very susceptible to both denting and scratching. That is why you see fewer and fewer gold necklaces available today. When you see that a piece of jewellery is said to be "gold plated", all it really means is that a microscopically thin layer of gold has been placed over the surface of another metal like copper. This process is called electroplating and creates a product that is resistant to wear and tear. In most uses, it is the closest you can get to a necklace made of real gold. Just as gold plated necklaces, one can buy gold necklaces made of steel, which has also been coloured by electroplating. These are the necklaces that we offer. At Trendhim, we only use 316L stainless steel for our necklaces, which is better known as surgical steel, recognized as the strongest steel for producing jewellery. With a gold necklace in surgical steel you get a really strong and durable necklace without it being as overpriced as gold and gold plated necklaces. Silver always has such a lovely sheen when made into jewellery which explains the on going popularity of silver pieces. Necklaces made of real silver must be stamped to indicate its true silver content such as 925 Sterling silver. That indicates it contains 92.5% of pure silver, the balance being copper usually. You cannot create fine silver jewellery using pure silver because that element is too soft so the copper gives it the required rigidity for jewellery making. We often receive questions about the length of necklaces for men. This boils down to mostly a matter of personal taste. In recent years, the trend has been to let it hang further down your torso to somehow make a fashion statement. 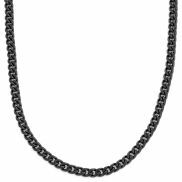 Most of the supplied chains are 90 and 80cm, featuring locks that let you decide what length fits what occasion. 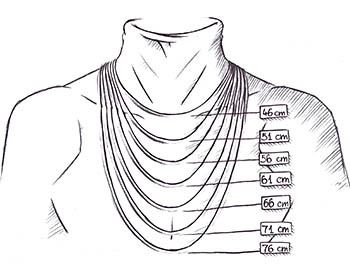 In the picture below, you can see the lengths in cm of the necklaces and worn by a young male model with a medium build. At Trendhim, we specialize in necklaces made of steel. We only use 316L surgical steel in making our necklaces, which is the strongest steel for this purpose. Steel is an extremely strong material and is polished in the same manner as silver. Steel has a delightful weight to it and does not require the maintenance needed for silver and gold jewellery.